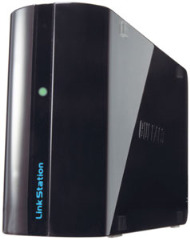 New LinkStation Mini is 150% faster than previous model*. This Model is an ultra compact, fan-less, network attached, dual-drive data storage device. Its palm sized form factor and very silent operation make this NAS unit an ideal addition to your entertainment center. The built-in Web Access feature lets you access your files anytime via a Web browser from anywhere! A built-in DLNA CERTIFIED™ media server makes streaming audio and visual content to any DLNA player or PC a snap. Business class features like Active Directory support make this portable NAS a good solution for IT personnel that have to serve remote office locations.